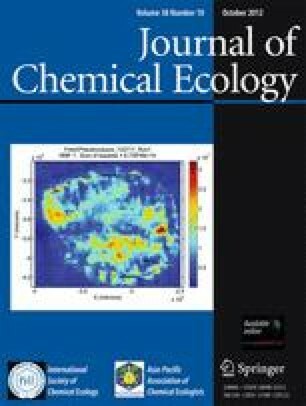 Using herbivore-induced plant volatiles (HIPVs) to attract specific natural enemies in the field has proven challenging, partly because of a poor understanding of: (i) which compound(s) to manipulate to attract specific taxa, and (ii) the ecological conditions over which HIPVs are effective. To address these issues, we quantified the response of a complex arthropod community to three common HIPVs (methyl salicylate, cis-3-hexen-1-ol, and phenylethyl alcohol) as individual compounds and equal part blends in corn and soybean fields. Of 119 arthropod taxa surveyed, we found significant responses by four species in corn fields (2 parasitoids, 1 herbivore, and 1 detritivore) and 16 in soybean fields (8 parasitoids, 3 predators, 4 herbivores, and 1 detritivore), with both attractive and repellent effects of the HIPVs observed. For example, tachinid flies were highly attracted to cis-3-hexen-1-ol (ca. 3-fold increase), but repelled by methyl salicylate (ca. 60 % decrease). Surprisingly, we found very few cases in which HIPVs acted synergistically; only two arthropod groups (ichneumonid wasps and phorid flies) were more attracted by a blend of the HIPVs than by the individual compounds composing the blend. Crop type, however, had a strong impact on the strength of arthropod responses to HIPVs. A few arthropod species were broadly affected across both crops (i.e., the herbivore Halticus bractatus was repelled by most of our treatments, regardless of crop background), but overall more arthropod groups responded to HIPVs released in soybean fields compared with corn. This was true despite the fact that taxa responding to HIPVs were present and abundant in both systems, suggesting that crop-based outcomes were likely driven by the plant matrix rather than mere differences in taxonomic composition of the arthropod community in corn vs. soybean fields. As a whole, these results suggest that: (i) repellent effects of HIPVs on natural enemies of herbivorous insects can be observed as frequently as attractive effects; (ii) odor blends may be no more effective than single-compound lures for some taxa; and (iii) crop background alters the magnitude of attraction to HIPVs, depending on the species being targeted. The online version of this article (doi: 10.1007/s10886-012-0202-y) contains supplementary material, which is available to authorized users. We thank Brian Brown (Natural History Museum of Los Angeles County) for his help with phorid identifications, Purdue University, and USDA (NIFA, Grant No. 2011-67013-30126) for funding this work. Thanks also to Gina Angelella, Carmen Blubaugh, Matthew Ginzel, Ulianova Vidal-Gómez, Jessica Kelly, Christian Krupke, Cesar Rodriguez-Saona, and two anonymous reviewers for help and insight in designing the project and writing the manuscript.